Once widespread throughout coastal areas of these regions, angel sharks have suffered steep declines throughout their historic range. Information on Sawback Angelshark and Smoothback Angelshark is severely lacking, however the Canary Islands have been identified as a unique stronghold for the Angelshark, as this species is still regularly sighted. Angelshark distribution: Diving and sportfishing organisations show their clients how to record Angelshark sightings on the sightings map. Citizen science data will be regularly analysed by the ASP team. Angelshark movement and site fidelity: investigated through visual ID tagging, acoustic tagging at key hotspots and genetic research. 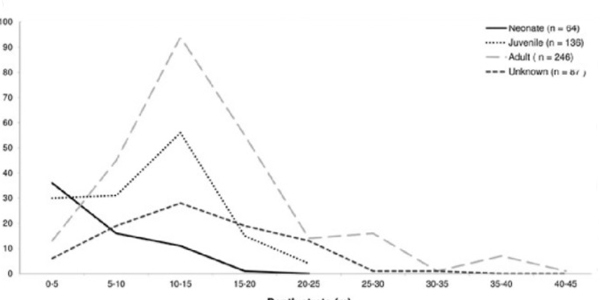 Angelshark reproduction and juvenile ecology: Confirmed Angelshark nursery areas are studied using mark-recapture tagging surveys and genetics to understand juvenile Angelshark growth rates, site fidelity and philopatry. Working closely with sportfishing companies to reduce Angelshark mortality in the Canary Islands (see our Best Practice guide). 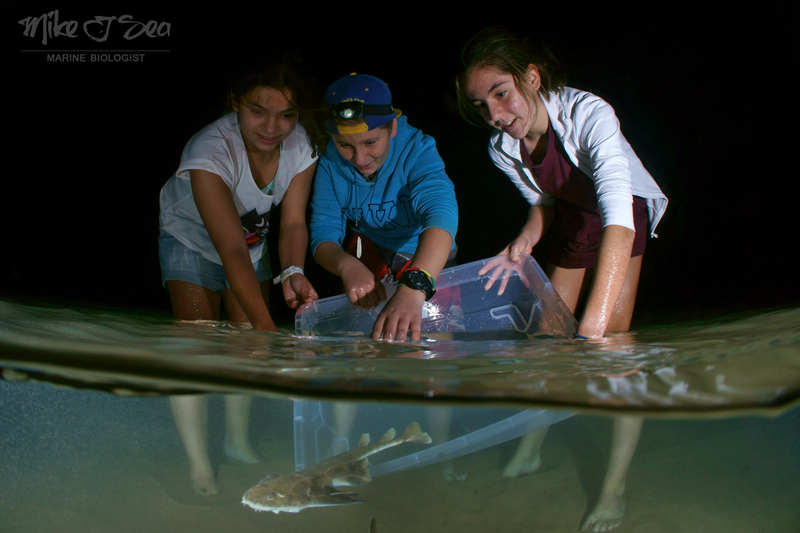 Completing research to understand the impact of the recreational fishing sector on Angelsharks. Working with key commercial fishers to reduce incidental catch of Angelsharks. Developing an Angelshark code of conduct to eliminate diving-related disturbance of Angelsharks. The Angelshark Action Plan for the Canary Islands was developed with local stakeholders to identify key actions needed to improve Angelshark conservation in the Canary Islands. Provide information and work closely with local, national and European governments to improve the levels of Angelshark protection in relevant legislation. Highlight important Angelshark habitats that would benefit from spatial protection. Raise awareness amongst divers, fishers and coastal communities that the Canary Islands is the unique Angelshark population stronghold in Europe. The local population, expatriate population and visitors to the Canary Islands are aware of the status of Angelsharks and advocate for the conservation of Angelsharks in the region. Visitors understand the importance of the Canary Islands to Angelshark conservation and choose recreational activities based on the minimal impact on Angelsharks. In 2016, two Angel Shark Conservation Workshops were completed to identify the key actions needed to be taken to overcome the major threats to angel shark populations. A multifaceted group of divers, fishers, scientists, NGOs, shark experts and government officials attended the workshops to develop two key documents. The Strategy provides a framework for improved protection of the three Critically Endangered angel sharks present in these regions. In particular, to improve the overall profile of angel sharks; increase the number of sightings reported; generate a better understanding of current distribution; contribute to IUCN Red List re-assessments and identify new collaboration opportunities to increase conservation action. The protection of the Angelshark in its last remaining stronghold is of upmost importance. The Action Plan identifies and explains in detail the key objectives and actions needed to achieve our Vision. It is intended to promote coordinated conservation action for this species in the Canary Islands. All organisations and individuals are invited to help or lead the implementation of actions. If you have supplementary information about angel sharks, please complete the questionnaire. 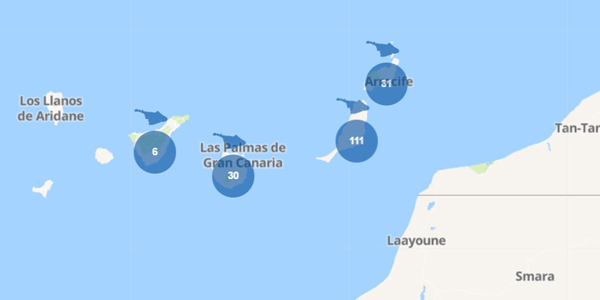 Please help us protect Angel Sharks in the Canary Islands, East Atlantic and Mediterranean Sea by reporting your sighting to the Angel Shark Sightings Map. This information will be shared amongst the Partners and Collaborators to better understand and conserve Angel Sharks in the region. The success of the Action Plan and Strategy is ultimately down to the individuals and organisations working together towards the common Visions. 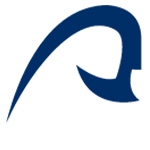 All interested parties are invited to join the ASCN, help to deliver the objectives laid out in each document and receive updates on angel shark conservation news. Facilitate dialogue and information sharing on all matters concerning angel shark conservation, including collaborative projects and joint funding opportunities. Host an email-group to send updates, providing information on activities in progress or completed as part of the Action Plan or Strategy. Ensure that consistent and clear messages regarding angel shark conservation is delivered to the wider community. Join our multidisciplinary Angel Shark Conservation Network (ASCN) and help us to protect these Critically Endangered sharks. The following organisations work alongside a number of individuals as part of the ASCN. The organisations in this list will be updated quarterly with additional members. The International Union for the Conservation of Nature Species Survival Commission Shark Specialist Group (SSG) is a global network of experts in the biology, taxonomy, use, and conservation of sharks, rays, and chimaeras (cartilaginous fishes, Class Chondrichthyes). 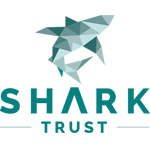 The Shark Trust is a well-respected advocate for shark management and protection, working to safeguard shark and ray populations by advocating for science‐based conservation and sustainably managed fisheries. ZSL is a world leader in wildlife conservation, science and education. As a charity we have active conservation projects in over 50 countries together with our two Zoos, ZSL London Zoo and ZSL Whipsnade Zoo. The Universidad de Las Palmas de Gran Canaria (ULPGC) is one of the leading Spanish universities and is a leader in the use of new technologies and research related to marine and maritime areas. It is comprised of 153 research groups covering all fields of knowledge. Zoological Research Museum Alexander Koenig (ZFMK) is one of the largest natural history research museums in Germany. The museum has earned its reputation as a leader in the documentation, research, and interpretation of biodiversity. We are a Welsh Government Sponsored Body. 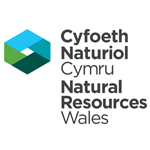 Our purpose is to ensure that the natural resources of Wales are sustainably maintained, enhanced and used, now and in the future. 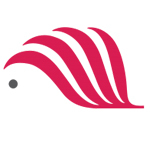 iSea is a Non Profit Non¬Governmental Organization founded in March 2016 in Thessaloniki, Greece with the aim to preserve the aquatic habitats, including the fauna and flora, which inhabit them through research, raising awareness and the promotion of conservation policies. 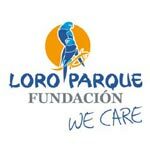 Loro Parque Foundation has been working since 1994 for animal welfare and biodiversity conservation. We do this primarily from our headquarters in Tenerife, but we are also present in many other parts of the planet, collaborating with local NGOs. The Angel Shark Conservation Network (ASCN) is working with partners to deliver actions set out in the Action Plan and Strategy. Major achievements are shown below. Full details of angel shark conservation news and research are sent to the ASCN through quarterly e-bulletins. A collaborative sightings map was developed in December 2016 to have a central coordinated system to gather sightings of angel sharks across their range. The Angel Shark Project used data collected through POSEIDON (a citizen science program to collect marine biodiversity data in the Canary Islands), to identify the distribution patterns, habitat use and population structure of the Angelshark (Squatina squatina) in its last stronghold. 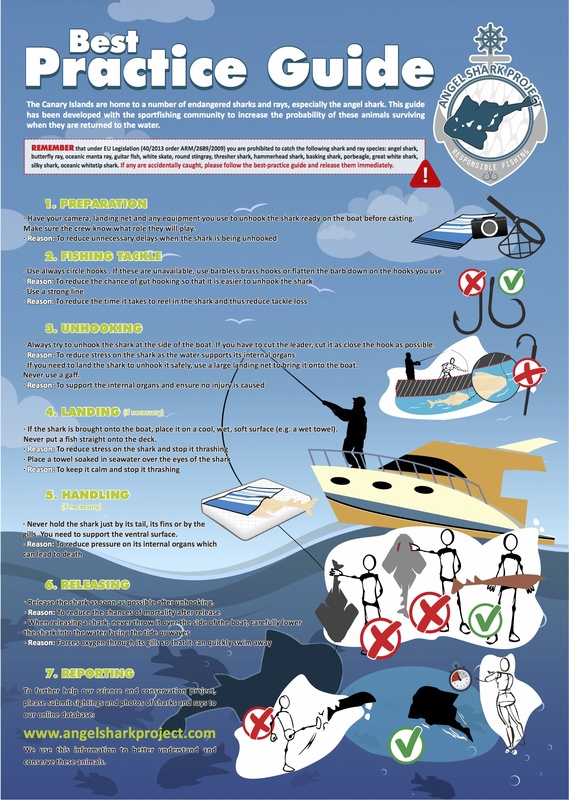 The Angel Shark Project and Natural Resources Wales are asking fishers across Wales to report any accidental captures of Angelsharks and follow best practice guidance to ensure Angelsharks are safely return to the water unharmed. Developed by the Angel Shark Project and recreational fishers in the Canary Islands to reduce Angelshark mortality after accidental capture. The Angel Shark Project completes questionnaires with clients of sportfisher charter boats in the Canary Islands to evaluate impact of the fisher engagement work. Escánez Pérez et al. 2016. Estudio del primer área de cría del Angelote (Squatina squatina) descubierta en Canarias. Do you dive in Fuertventura? Do you want to help Angelshark conservation? Join the FIRST Count the Angels event to help us understand how many Angelsharks are in the Canary Islands! Our aims for the genetic analysis are to understand the population structure and reproductive behaviour of Angel Sharks in the Canary Islands and also investigate the connectivity of Angelshark populations across the East Atlantic and Mediterranean Sea. The Angel Shark Project has gathered tissue samples from the Canary Islands, Wales, Ireland and the Mediterranean to see whether the remaining Angeshark populations are connected or are isolated units. This robust data will feed into the East Atlantic and Mediterranean Angel Shark Conservation Strategy. Whenever we tag an Angelshark in the Canary Islands, we also collect a genetic sample to understanding the connectivity between islands in the Canary Islands archipelago. Previous results suggest that geographical elements of certain islands might isolate populations, so we are using our genetic analyses to compare samples from different islands and localities. The genetic work focused at Las Teresitas (the only confirmed Angelshark nursery area) focuses on exploring the reproductive behaviour and population structure at this important site. In 2018, we completed the first acoustic tagging study of Angelsharks to improve understanding of habitat use, movement and site fidelity in the La Graciosa Marine Reserve. The initial phase of this project was to develop an external electronic tag attachment methodology to fit acoustic tags to Angelsharks underwater. It was important to us to complete this work in the Angelshark’s habitat to ensure minimal stress to the species. During two expeditions in July and November 2018, 7 acoustic receivers were deployed around the La Graciosa island and 22 Angelsharks were fitted with acoustic tags! We will find out the results in 2019! Visual identification tagging is an easy and effective way to gather information about Angelshark habitat use. A coloured tag, a different colour for each island, with a unique code is placed between the two dorsal fins for each shark, making it easy for divers to identify the individuals. If you find a tagged Angelshark please report your sighting to our interactive map. The colours for each island are: Lanzarote and La Graciosa: Green, Fuerteventura: Orange, Gran Canaria: Pink, Tenerife: Yellow/ brown. Our unique underwater tagging methodology was developed to ensure minimal stress for the sharks. Dyddiadau cyhoeddi! Ymunwch â Sioe Deithiol Hanes Maelgwn! Dewch â’ch ffotograffau, atgofion neu wybodaeth Maelgwn neu diwydiant pysgota pan oeddech chi’n tyfu i fyny a gweld sut mae’n helpu i ddarganfod hanes Maelgwn yn nyfroedd Cymru. Save the date & join the Angelshark History Roadshow!